Sarah's Stamp Lab: Breaking News! Petite Curly Label Punch Available for Purchase! Breaking News! Petite Curly Label Punch Available for Purchase! Remember that little event Stampin' Up! had the last couple of months....Sale-A-Bration? Did you miss out on the opportunity to get the adorable Petite Curly Label Punch? Normally SAB items are retired, but not this little gem of a product! 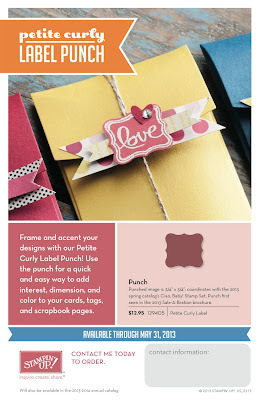 Available now through May 31st, 2013, you can order the Petite Curly Label punch (129405) for $12.95 + tax and shipping. This punch coordinates with the Ciao, Baby! stamp set in the Spring Catalog! Glad to hear this! I need to decide if I want this punch; I didn't get the Ciao Baby set, as the sentiments didn't appeal. I find myself wondering if they're going to put out more sets to work with the punch as a result of this news.